Huge Savings Item! Free Shipping Included! Save 15% on the Trinity EcoStorage Bamboo Baker's Rack by Trinity at Tim Park Design. MPN: TBFZ-1501. Hurry! Limited time offer. Offer valid only while supplies last. 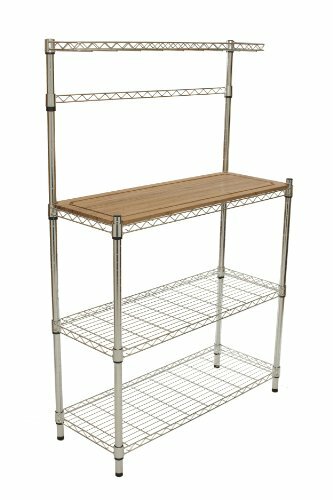 TRINITY's EcoStorage Bamboo Baker's Rack is a great addition to any kitchen or pantry area. The bamboo surface can be either on or off the rack. TRINITY's EcoStorage Bamboo Baker's Rack is a great addition to any kitchen or pantry area. The bamboo surface can be either on or off the rack. Shelves are adjustable in 1" increments for your own custom configuration. Also included is a hanging bar with 6 hooks. Calunce Plastic ESD Antistatic Circulation Rack Shelf H shape PCB Conductive Angle Rack 17.13"×6.30"×1.18"